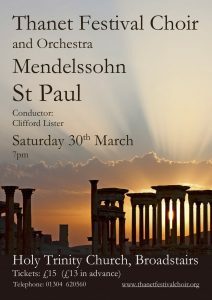 We’ve really enjoyed the rehearsals for our next concert, Mendelssohn’s St Paul. It’s a fantastic work, reminiscent of the great Bach Passions and of Mendelssohn’s other great oratorio Elijah. There are lots of dramatic moments and rip-roaring choruses, contrasted with some gorgeous chorales and beautiful arias. 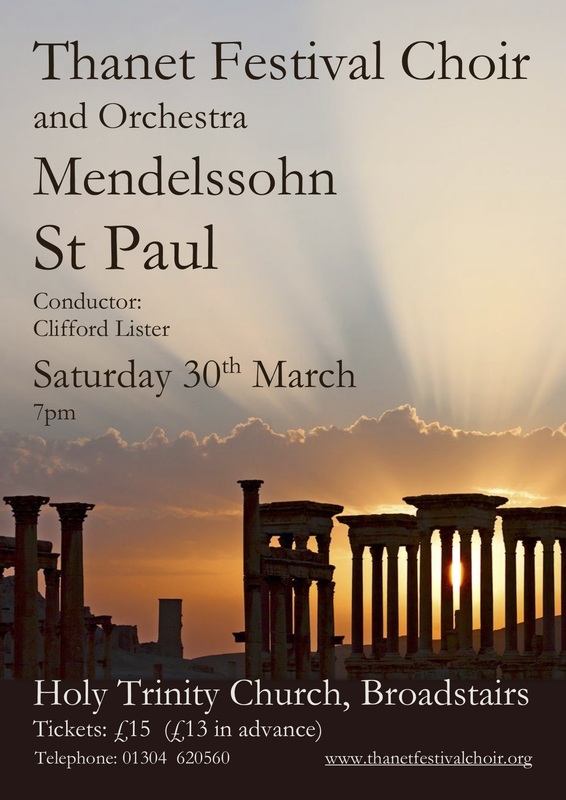 We have outstanding Soloists, an excellent 29-piece orchestra, and a well-rehearsed and passionate choir, so a wonderful and memorable evening is guaranteed. The concert will take place in the beautiful surroundings of Holy Trinity Church Broadstairs on Saturday 30th March, starting at the slightly earlier time than usual of 7.00pm. Get your tickets at the advance price of £13 now – the price on the day is £15.